Summers in the BuckeyeState can be sticky and humid. Beat the heat by visiting one of Ohio’s many fun-filled water parks and beaches. Spend the day at one of Cleveland’s most diverse beaches. Not only is swimming a favorite pastime at FairportHarborLakefrontBeachPark, but canoeing, kayaking, boating and sailing are also available. (Kayaks and paddle boards can be rented at the park.) A picnic area, playground and volleyball courts offer even more activities for beachgoers. Located in FairportHarbor, the park offers something for every member of the family. Visit http://www.lakemetroparks.com/select-park/fairport.shtml or call (440) 639-9972 for more information. One of the largest water parks in Ohio, SoakCity at KingsIsland is not just a day at the pool, but a fun-filled adventure. SoakCity features activities that range from relaxing (a lounging pool) to thrill-seeking (with water slides like Pipeline Paradise, Zoom Flume and Mondo Monsoon). Admission to SoakCity is included with park admission to KingsIsland, but tickets can also be purchased separately. Visit http://www.visitkingsisland.com/things-to-do/soak-city-waterpark?gclid=CJ2n_6eQurcCFc1cMgodEkIAlg to learn more. Located in downtown Columbus, BicentennialPark is home to Ohio’s largest splash pad. As part of the Scioto Mile Fountain, the splash pad offers hundreds of water misters and jets. After a day of sun, visit nearby Columbus commons for a carousel ride or an ice cream cone. The splash pad is free to visitors and opens April through October. Visit http://www.sciotomile.com/parks/bicentennial-park/ for more information. Take a step back in time at retro Coney Island in Cincinnati. As one of the oldest entertainment parks in the Midwest, Coney Island is also home to the Sunlite Pool, the largest flat surface pool in North America. Spend time lounging in the pool or visit the many water slides available at the park. Check out the theme park’s website, http://www.coneyislandpark.com, to learn more. A short ferry ride across Lake Erie from Sandusky or Marblehead leads to KelleysIslandState Park. Although KelleysIsland does not offer water rides or children’s activities, it does reward visitors with panoramic water views and a relaxing and secluded beach experience. After swimming, spend time hiking the trails or fishing in Lake Erie. Visit http://www.dnr.state.oh.us/parks/parks/lakeerie/kelleys/tabid/18980/default.aspx, or call (419) 746-2546 for more information. Take advantage of the warm weather and escape to some of Ohio’s favorite water parks and beaches this season. A new beginning for an American icon. you they hit a Grand Slam. Their meticulous attention to detail has resulted in a sedan that instantly rockets to the top of the full-size segment and delivers a score of advantages over the competition and best of all it’s on sale now here at Jack Maxton Chevrolet in Worthington, Ohio. Road & Track magazine called the new Chevy Impala “a vastly better sedan” than its predecessor, while Motor Trend characterized it as “big, strong, smooth and stylish.” In a head-to-head comparison between the new Impala and its five key rivals, Car and Driver praised the Chevy for its many advantages over the field––including ride quality, interior spaciousness and cargo capacity––and concluded that “the Impala feels as solid as an S-Class” Mercedes-Benz. The new, tenth-generation Impala captured the attention of the automotive press upon its unveiling at last year’s New York Auto Show. The editors at Autoblog.com wrote that the sedan’s arched rear fenders hearkened back to the ground-breaking 1958 Impala, while Car and Driver likened the new model’s looks to “a four-door Camaro.” Chevy stylists incorporated subtle design cues that pay homage to famous Impala models of the past, but the wind-swept design language they developed––with its broad horizontal-bar grille, power-dome hood, sculpted side coves, understated chrome accents, generous rear overhang and diagonal dual-signature taillamps––clearly looks forward, laying claim to classic status in its own right. The editors at Autoblog.com praised Impala designers for “creating a nearly flawless cabin,” and Road & Track described the designers’ handiwork as “world class.” The interior’s soft-touch surfaces, chrome accents, dynamic instrument cluster and wraparound, dual-cockpit layout all received special notice, as did premium details like available leather trim, French stitching, suede inserts and ice-blue ambient lighting. Thanks in part to its longer wheelbase, the new Impala offers an increase in total passenger volume to 105 cubic feet, a three-cubic-foot advantage over the Ford Taurus. The Impala also bests the Taurus in front head room (39.9 inches versus 39.0 inches), front legroom (45.8 inches versus 41.9 inches) and rear legroom (39.8 inches versus 38.1 inches). Along with its segment-pacing interior volume, the new Impala offers a huge 18.8 cubic feet of maximum trunk space, easily surpassing the Toyota Avalon (16 cubic feet) and the Hyundai Azera (16.3 cubic feet). Befitting a flagship sedan, the Impala offers a serene driving environment courtesy of its stiffer body structure and the generous application of advanced sound-deadening technology such as acoustic laminated glass, triple-sealed doors and Active Noise Cancellation. The engine lineup expands to three and includes the 3.6-liter V6, which receives a bump in output for 2014 to 305 hp and 264 lb/ft of torque. A new ECOTEC 2.5-liter four-cylinder making 195 hp and 187 lb/ft of torque joins the ranks, while later this year an ECOTEC 2.4-liter four-cylinder with eAssist light electrification technology becomes available. The latter uses an electric-assist generator to help crank out 183 hp while returning a thrifty 35 mpg highway. All three engines boast advanced fuel-saving technology, including direct fuel injection and variable-valve timing, and send power to the front wheels via an electronically controlled six-speed automatic transmission. New electric power steering delivers quick, linear response to driver inputs, and the available variable-effort feature boosts power assistance at low speeds. The thoroughly revised suspension delivers a smooth, compliant ride at cruising speeds as well as crisp, agile handling during sharp maneuvers. Credit for this impressive balance goes to new front struts with constant-rate rebound springs and a carefully tuned multi-link suspension setup at the rear wheels. The Impala leaps to the top of the segment in terms of safety, too, with 10 airbags, StabiliTrak Electronic Stability Control, four-wheel antilock brakes and OnStar with Automatic Crash Response all on hand to keep you secure. The new model also offers a suite of available driver-assistance technology that includes the first use of full-speed-range Adaptive Cruise Control in a Chevy. The list also includes a Rear Vision Camera, Forward Collision Alert (another Chevy first) with Crash Imminent Braking/Collision Mitigating Braking, Lane Departure Warning and Side Blind Zone Alert with Rear Cross Traffic Alert. Along with premium safety, the new Chevy Impala delivers spectacular value. Even the entry Impala LS (MSRP $26,725) comes comprehensively equipped with standard features, including an eight-way power driver seat, Bluetooth connectivity, remote keyless entry, a 4.2-inch color display mounted in the gauge cluster, 18-inch wheels and roadside assistance for five years/100,000-miles. 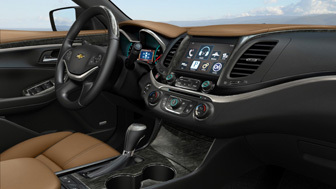 The 1LT trim raises the ante with heated outside mirrors, four-way power for the front passenger seats, a leather-wrapped shift knob and steering wheel, dual-zone climate control and an eight-inch color touch-screen (that flips up to reveal a storage bin) complete with the Chevrolet MyLink® system for audio, navigation and smartphone integration. The top-tier 1LTZ (MSRP $33,745) and 2LTZ (MSRP $35,770) add leather upholstery, heated front seats, remote keyless entry and start, High-Intensity Discharge headlamps, LED daytime running lamps, a power sunroof, dual exhaust with bright tips, and standard 19-inch or available 20-inch aluminum wheels. Chevy calls the new Impala “a striking departure from the status quo” among full-size sedans. Experience all the paradigm-shattering excitement for yourself by scheduling a test drive of the all-new 2014 Chevy Impala today. 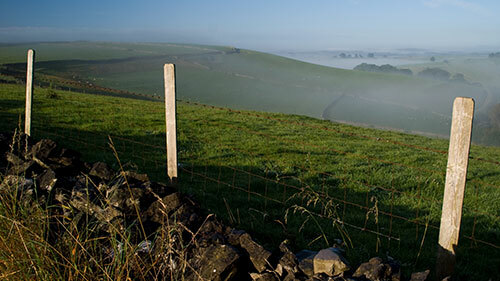 Ohio offers a diverse terrain for hikers seeking a challenging climb and scenic views. From the flat plains of central Ohio to the rolling hills in the south, Ohioans are sure to enjoy an exciting excursion along the many trails of the BuckeyeState. To experience one of the most scenic views Ohio has to offer, visit Clifton Gorge in Yellow Springs. You may begin your hike at Clifton Mill, which is one of Ohio’s oldest working water mills. For a shorter one-mile hike, take the Rim Trail, which leads past the breathtaking views of the gorge and waterfalls. For a longer hike, continue the trail into JohnBryanState Park. Trails can be slippery at times, and proper footwear and attire is recommended. Pets are not allowed within Clifton Gorge State Nature Preserve or JohnBryanState Park. Visit http://www.dnr.state.oh.us/tabid/882/default.aspx for more information. If you thrive on adventure, Conkle’s Hollow in Hocking Hills is one of the most difficult hikes in Ohio. At just over 2.5 miles, the upper rim of the Conkle’s Hollow trail meanders around steep cliffs and overhangs. Your work is well-rewarded with views of waterfalls near the trail’s end. Children and pets are not permitted on the Conkle’s Hollow Upper Rim Trail because of safety concerns and an occasional bear sighting. Conkle’s Hollow is located in Rockbridge. Go to http://www.dnr.state.oh.us/location/dnap/conkles_hollow/tabid/884/Default.aspx for a detailed map. If you’re looking for a smooth path appropriate for children of all ages, consider the Miami and Erie Towpath Canal Trail near Grand Rapids. The trail begins at ProvidencePark, located just outside Grand Rapids. The trail follows the Maumee River for eight miles and offers a wide range of water views. Plan your visit at http://www.metroparkstoledo.com/metro/parksandplaces/index.asp?page_id=517. With 26 sections totaling almost 1,500 miles, the Buckeye Trail is the longest hiking trail in Ohio. It makes a continuous loop around the state and covers the hilly terrain of the southern parts of the state up to Lake Erie beaches. You can start anywhere on the trail for an afternoon hike or camp in approved campsites directly off the trail for longer hikes. A detailed map of the Buckeye Trail can be found at http://www.buckeyetrail.org, or by calling the Buckeye Trail Association at (740) 832-1282. With eight short and easy hiking trails available, Quail Hollow is one of the most accessible parks in Ohio. The “Nature for All” trail offers more than 2,000 feet of paved trail for those requiring a smooth surface or wheelchair accessibility. Located in Hartville, Quail Hollow also offers a nature center and picnic shelters. Check out http://www.dnr.state.oh.us/parks/quailhlw/tabid/783/Default.aspx for information. Whether you want a short afternoon hike or a week-long excursion, there is an Ohio hiking trail for you. A new Chevrolet Corvette is an event. Passion runs deep for this high-achieving sports car among both the public and the talented engineers and designers at Chevrolet who develop the model. The 2014 Chevrolet Corvette Stingray made its debut in Detroit at the North American International Auto Show in January, and the world will never be the same when it goes on sale shortly here at Jack Maxton Chevrolet in Worthington, Ohio. Because there’s a relatively long period between new generations of the Corvette, Chevrolet really sweats the details. Glancing quickly at the all-new C7 generation, the 2014 Corvette Stingray Coupe and Convertible, is impressive enough, but diving into the full list of changes will really raise your eyebrows. It all starts with the brand-new frame that’s made from aluminum to keep weight down and increase strength. It lends the 2014 Corvette Stingray an unshakeable foundation, and the body is made of lightweight materials, too. The removable roof panel and hood are carbon fiber, while underbody panels are carbon nano-composite. The careful attention to weight management has led to a perfect 50/50 front/back weight distribution. In between those new aluminum frame rails is the all-new LT1 V8. The 6.2-liter engine combines the classic packaging efficiency of a small-block V8 with advanced modern technology like continuously variable valve timing and direct fuel injection, and it delivers 450 hp and 450 lb/ft of torque. That’s enough power to make the 2014 Stingray the quickest standard Corvette ever, capable of accelerating to 60 mph in less than four seconds. The high-performing new Stingray is more efficient than ever before. Active Fuel Management brings cylinder deactivation to the Corvette for the first time and helps reduce fuel consumption during cruising. You’ll be able to make the most of the tidily-packed engine’s big power thanks to a new seven-speed manual transmission that ensures you can hold the engine at the exact power level you need for the driving challenge you’re facing. Coming out of a tight corner? With seven ratios to choose from, there’s one that’s perfect for keeping the LT1 on boil so you can squeeze the pedal and flex the engine’s muscle as you rocket away from the apex. Seven speeds also means an overdrive top gear that’s steep enough to improve on the outgoing Corvette model’s still-impressive 26 mpg. The new suite of standard technology doesn’t stop with a modernized small block and a new transmission. The 2014 Corvette Stingray features Active Rev Matching, which anticipates your next shift and automatically adjusts the engine speed for smooth, quick, expert-perfect shifts every time. In the new carbon fiber- aluminum- and ultrasuede-trimmed interior, a Drive Mode Selector gives drivers the choice of five distinct attitudes from the same car. Selecting between “Weather,” “Eco,” “Tour,” “Sport” and “Track” adjusts the responsiveness of the controls and changes the information the gauge cluster displays to help you focus at the task at hand, whether that’s driving in a downpour or coming off a banked turn at 120 mph. When equipped with the available six-speed automatic transmission, the 2014 Stingray features paddle shifters for manual control. The new cockpit has been designed for more comfort than ever before and is trimmed with fine materials assembled with careful craftsmanship. The interior is new right down to the magnesium frames employed in the brand-new seats, which are offered in a GT version and a Competition Sport version with heavier bolstering. 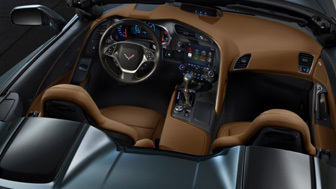 Chevrolet paid attention to what happens inside the Corvette at speed, which is why the passenger has a reinforced grab bar on the center console and the center console has soft-touch materials on its edge to cushion the driver’s bracing during hard cornering. A smaller steering wheel than before, now with a 14.1-inch diameter, gives the Stingray a direct, responsive feel. An abundance of soft-touch materials and available Nappa leather give the cabin a premium atmosphere. If the stellar performance of the standard Stingray isn’t enough for you, there’s the Z51 Performance Package that can tear up a race track with ferocity. Included in the Z51 package is an electronic limited-slip differential; a dry-sump oil system to ensure the engine is always lubricated, even in 1.0g sweepers; additional cooling systems for the brake, differential and transmission; and an Aero Package that enhances stability at high speeds. The 2014 Corvette Stingray Convertible is perhaps the model truest to the roots of the Convertible. After all, the first two generations of Corvette were conceived as sports cars with folding tops, and that’s a type of car that buyers today are still interested in purchasing. Instead of marginalizing the chassis rigidity of the Corvette Convertible by just hacking the roof off a coupe, the 2014 Stingray Convertible was designed independently, right along side its Coupe counterpart. They share the same solid structure, the same suspension tuning, the same fire-breathing performance, and they even weigh nearly the same. Instead of forcing compromise, the 2014 Corvette Stingray Convertible gives you all the performance, plus the added benefit of top-down driving enjoyment. Paying attention to details is what makes some good-performing cars into great vehicles. There is none greater than the 2014 Corvette Stingray. For its starting MSRP below $52,000, nothing can touch the performance of the Stingray, and because of intense attention to detail, it’s also packing an unbeatable level of refinement, technology and luxury.